So, the headlines are all over the Swiss paper, 20 Minuten, about America's Day of Decision. It will be quite the day for breaking news. Speaking of headlines, I wanted to share one of my own as my new column, called "Expat Adventure," begins this month in Swiss News, the National English Journal of Switzerland. If you don't have a subscription you can get one by visiting the website. 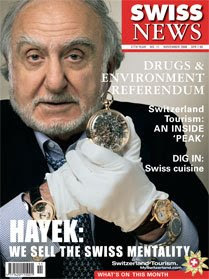 The magazine is also available at any Kiosk in Switzerland. The first piece is called "My Very Own Critic." Click to read! And please let me know your feedback or other topics you would like to hear about in the future. Great article! Congrats on the feature. I really enjoyed your article! I'm reminded how nice I have it here at our apartment house - my neighbors are very easy-going about the laundry - and I am so thankful. Really great article. I am so glad I live with a very flexible, forgiving, and eager to help family. Glad to hear others have had more positive laundry experiences in Switzerland! I laughed out loud at your laundry article. Thanks for the memories! Very fun! Did they ask you to write it in British English, since that's what everyone else in the world learns in school? Should I be ashamed that I empty my lint trap? The pub is written in British English. So they change all my spellings! It's a bit strange to see that I can write in British English after all, ha ha. Good for you about the lint! And you didn't even have to get trained in CH to do it.